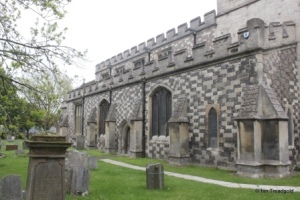 The church of All Saints in Houghton Regis is situated in the centre of the town of Houghton Regis which is now joined to Dunstable and Luton beyond. 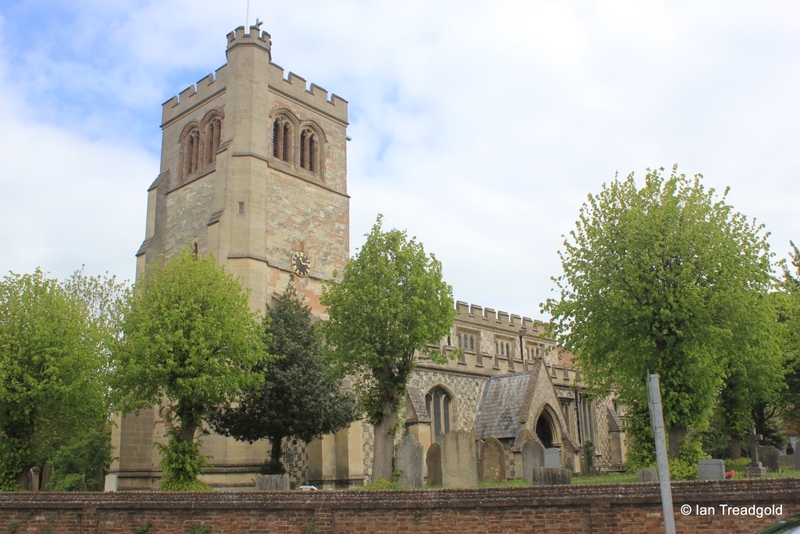 The church is on the main road (A5120) through Houghton Regis from the A5 to the M1 and beyond. There is parking available in the shopping centre car park next to the church. 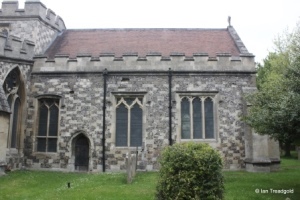 In layout the church consists of a chancel, nave, two aisles, west tower and south porch. 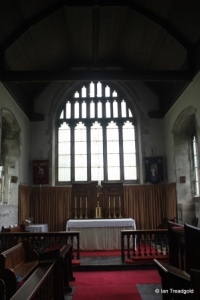 The chancel is around 40 feet by 19 with the nave adding 60 feet but little extra width. The two aisles are around 9 feet wide and the tower is some 15 feet by 16 and 70 feet high. 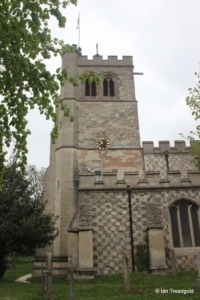 The core of the church was built early in C14 with the west tower added in C15, however most of the walls and windows were rebuilt or replaced in C19 and restorations continued through to repairs to the tower towards the end of C20. 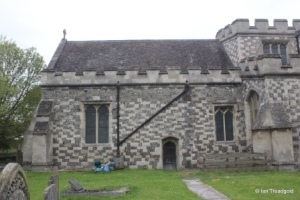 The main building is a chequer work of flint and Totternhoe stone. 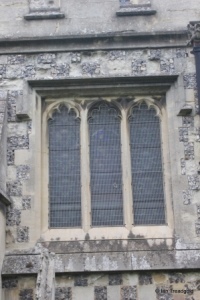 The south aisle has windows to the east and west and four windows on the south side surrounding the porch. 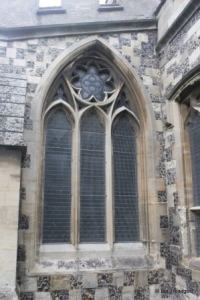 The east window is of three trefoiled lights with geometric tracery above under a pointed arch. 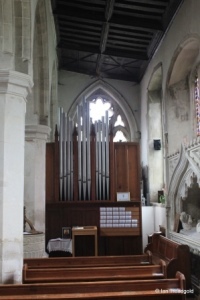 Inside, the east end of the aisle now houses the organ which dates from the 1850’s. 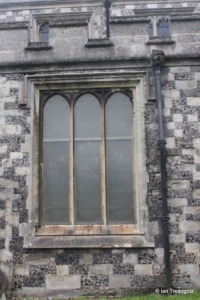 The two eastern windows of the south aisle are both three-light cinquefoiled windows under square heads of differing heights. 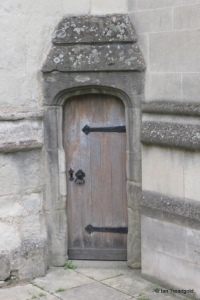 The reason for the different heights becomes apparent inside the aisle with the shorter window being above a recessed tomb. 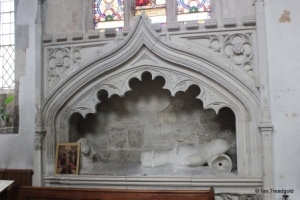 The tomb is believed to be that of Sir John Sewell a knight who accompanied the Black Prince into Aquitaine in about 1366. He is believed to have died in 1433. The Sewell name is reflected in the hamlet of that name to the west of Houghton Regis. Only the torso and head of the figure remains along with a lion guarding the missing feet. 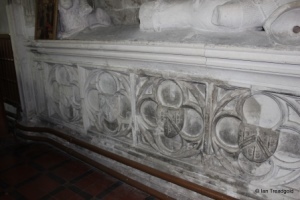 The carvings under the tomb are of the Sewell Arms - a chevron between three bees. The glass above dates from 1860. 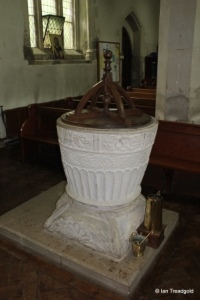 In front of the tomb is the fine circular Norman font of Totternhoe stone. 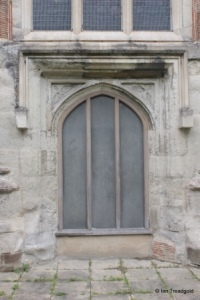 The modern windows surrounding the porch are of three trefoiled lights under a flattened four centred arch. 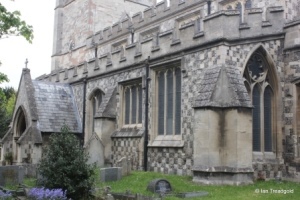 The high roofed porch dates from restorations in C19. The clerestory above the nave has four three-light cinquefoiled windows under square heads on each side. 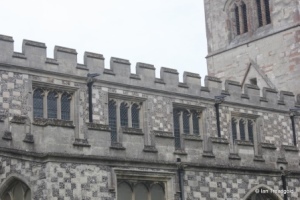 The parapet is crenelated throughout the church with the exception of the porch. 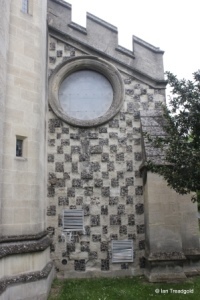 The west end of the south aisle has a large round window high against the current roof line. 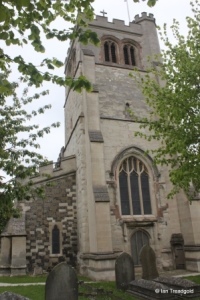 The tower is of three stages and dates from C15 with a stair turret in the south-west corner accessible from an external door snug against the south-west buttress. The belfry openings are pairs of two light trefoiled windows under conjoined four centred arches. 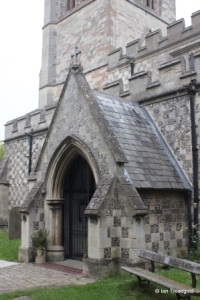 The west door, now blocked, is under a four centred arch with a square head above and foliage in the spandrels. 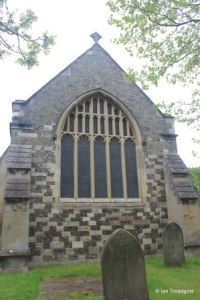 The modern west window is of three cinquefoiled lights under a two centred arch with perpendicular tracery above. There are shallow statue niches to the sides of the window. 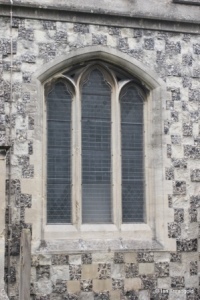 The north aisle has a single modern lancet style window in the west end. 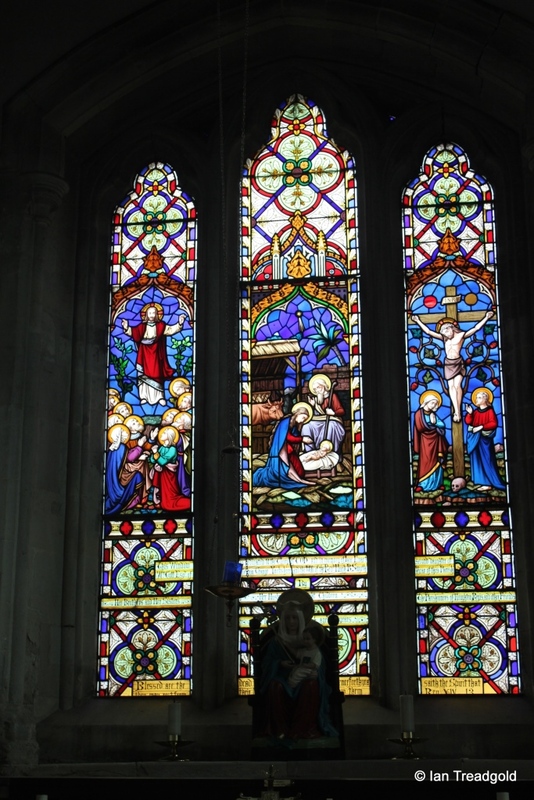 The north side of the aisle has four windows. 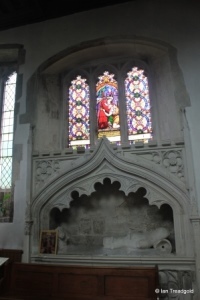 The western matches that in the west end of the aisle and these two lancet windows light the vestry. 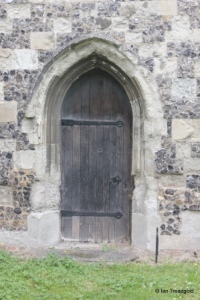 The central door is unporched and surrounded by two windows to match those surrounding the south door, each being three light windows under flattened four-centre arches. 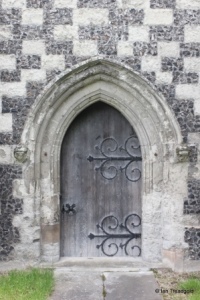 The north doorway is under a pointed arch with ornate hinges matching those on the south door although shorter having just two pair of swirls instead of three. 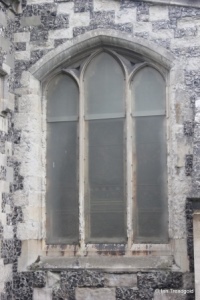 The eastern window of the north aisle has three cinquefoiled lights under a square head with the outside protected by plastic sheeting. 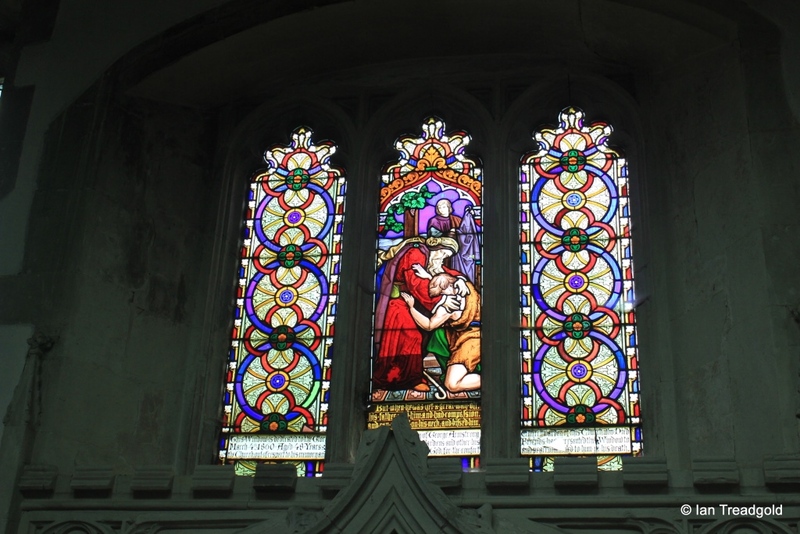 The glass dates from the 1860’s and commemorates Minna, the daughter of the then vicar Hugh Blagg-Smyth. 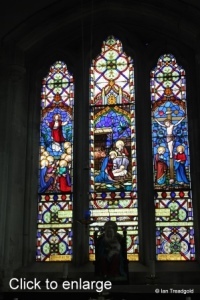 The money for the glass was raised from over ‘a thousand persons’ . 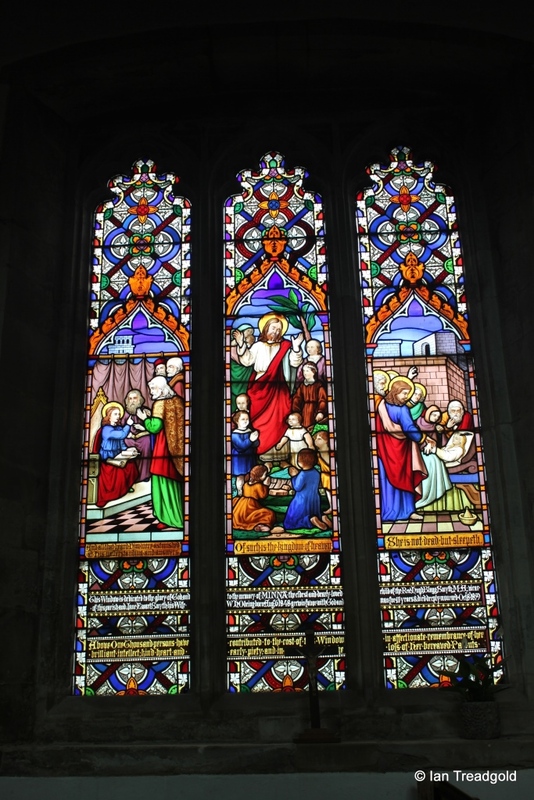 The window depicts scenes from Christ’s ministry with the faces of the children in the central pane taken from photographs, an early use of this medium in stained glass. 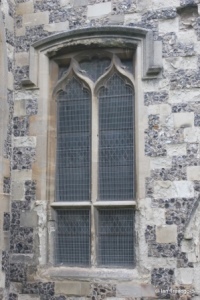 The east window of the aisle has three trefoiled lights under a four-centred arch with the glass now protected on the outside. 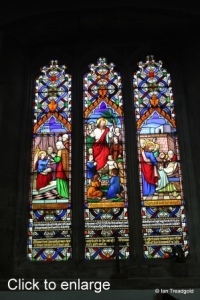 The glass dates from the 1860’s and depicts events in the life of Christ. 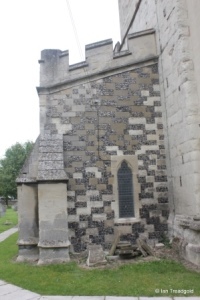 The north side of the chancel has two windows on either side of a door. The western is of two trefoiled ogee arched lights under a square head. 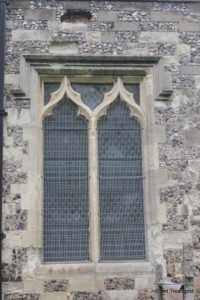 The eastern window of the north side of the chancel has two cinquefoiled lights under a square head. 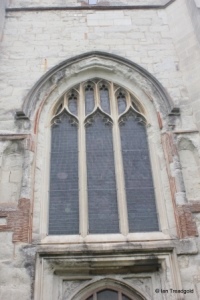 The east window is of five cinquefoiled lights with perpendicular tracery above under a wide two-centred arch. 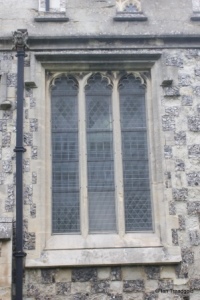 The south side of the chancel has three windows and the a door. 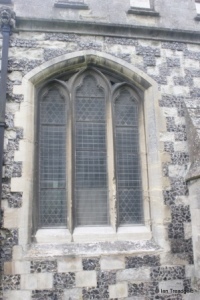 The eastern window matches the same window on the north side but is of three lights instead of two. 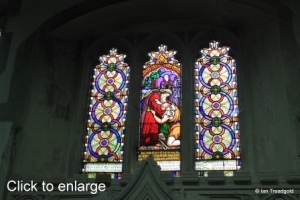 The central window matches the western window from the north sides being of two trefoiled ogee arched lights under a square head. 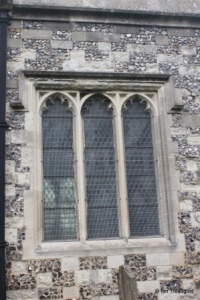 The western window on the south side is of two trefoiled ogee arched lights under an almost square head with a mullion in the bottom section. 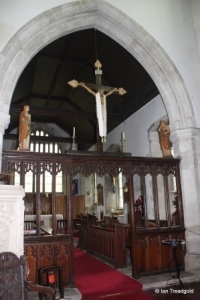 The rood screen dates from C15 with four bays surrounding a wide central opening. 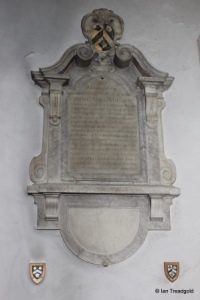 In the chancel is a memorial to Dame Alice Milard who built Houghton Hall in the early C18. Page last changed 23/05/2015. Reformatted 26/02/2016.